Released in March of 1992, OS/2 2.0 was the first desktop oriented OS for IBM PC compatible computers that was truly 32-bit. Microsoft was only just releasing Windows 3.1, and Windows NT was still over hyped vaporware. This was also the first version of OS/2 to be produced by IBM without the involvement of Microsoft. Among the many enhancements over previous versions, OS/2 2.0 included IBM's new Workplace Shell. The Workplace Shell is an icon driven graphical environment implementing IBM's common user access (CUA) '91 standard, part of a set of standards designed to facilitate a consistent user interface in applications across different platforms and OSes. The OS/2 2.0 boot logo. This is the Workplace Shell as it appears by default. If it looks dull, that is because it is supposed to be. 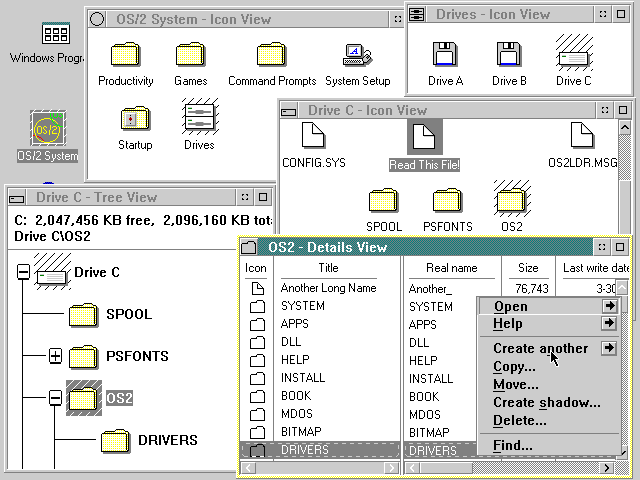 OS/2 was heavily criticized by the drooling masses because the appearance was simple and dull. What they failed to comprehend was that IBM had subjected OS/2 to heavy international acceptance testing (you might be surprised that the smallest unintentional thing can be offensive to a certain culture), accessibility testing (such as usability for the color blind), and legal review. 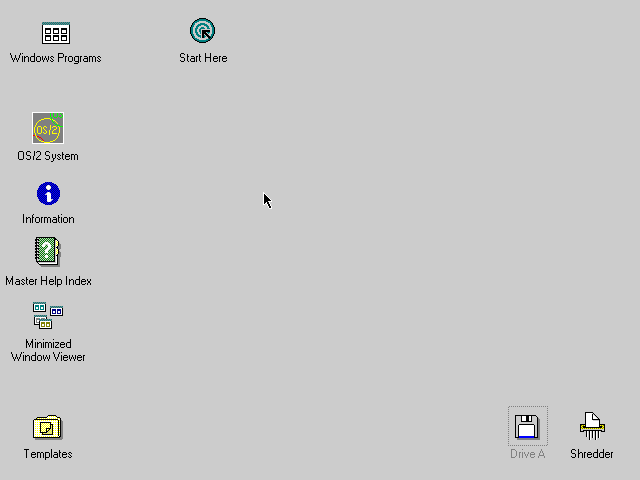 Like the Macintosh, OS/2 Workplace Shell uses desktop icons and folders. Icons may be documents associated with an application, folders (viewable as a tree, icons, or details), programs, or other "objects". IBM implemented the Workplace Shell using an object-oriented design. "Object-oriented" design was the buzzword of the day back then and it is reflected in the terminology. All icons in the Workplace Shell are are referred to as "objects". Examples of types of objects are Data-file objects, program objects, device objects, and folder objects that contain other objects. Explicitly referring to everything as an object gets annoying very fast. I might take a club object and bonk someone on their head object if I had to listen to that every day object. 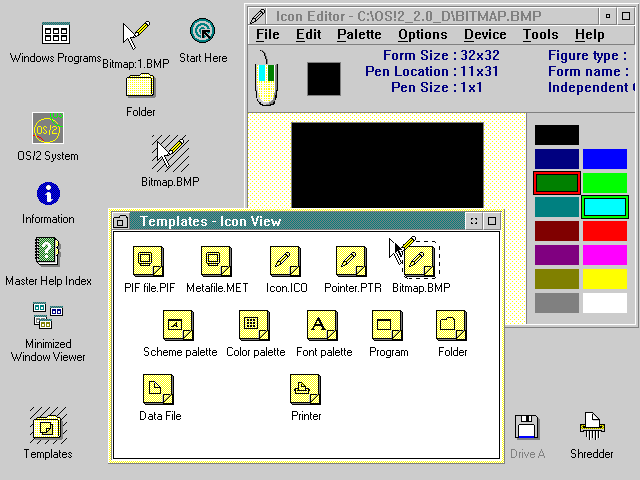 Some notable differences between the Workplace Shell and the Macintosh include the extensive use of both mouse buttons (buttons "1" and "2" as they are referred to) and the use of "pop-up" menus as the primary way to perform many functions. Several interesting popup choices are "create another" that you use to duplicate an object, and "create shadow" that you use to create an object with a link to the original object, similar to a shortcut or alias. Probably the neatest feature of the OS/2 Workplace Shell is that you can give folders different background colors or graphics. And no web browser needed! Throughout OS/2, it uses the notebook-like property pages shown above for different settings. You can drag icons to the Shredder to delete them. Files dragged to the shredder are deleted instantly rather than being stored in a temporary location until purged. To create a new object or document you drag a template out of the templates folder to the desktop. 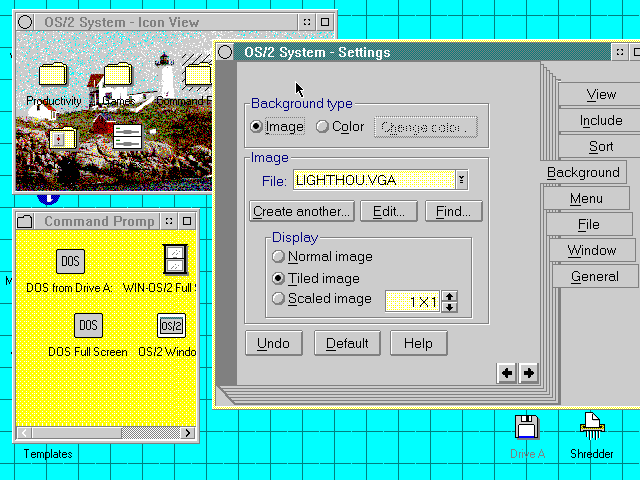 OS/2 2.0 also includes an icon editor that you can use to customize icons.